Great Lakes Growers co-owner John Bonner grew up with traditional farming. But he's embracing a new method of food production, hydroponics. His one acre greenhouse in Burton produces the equivalent of 25 acres of crop land. You may have noticed a new addition to the produce aisle in your local grocery store – lettuce with the roots still attached. The plants were grown in water instead of soil. That practice -- called hydroponics -- is getting more popular, locally and around the world. In this week’s Exploradio, WKSU’s Jeff St.Clair looks at two Ohio companies at the forefront of the movement, which is merging agriculture with manufacturing. Northeast Ohio is known for manufacturing – but assembly lines aren’t just for making cars and heavy machinery anymore. They can also be used to grow fresh produce. 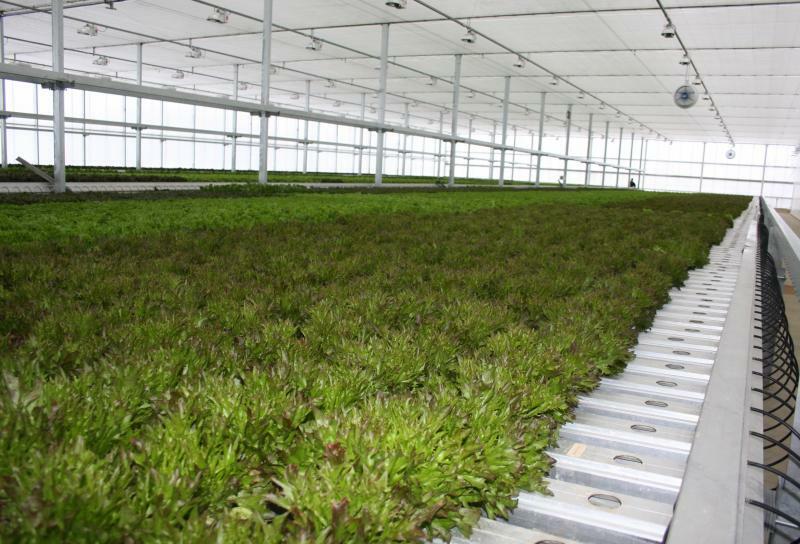 John Bonner’s factory floor is a sea of leafy greens- lettuce, basil, water cress, and arugula packed in neat rows. He co-founded Great Lakes Growers with partner Tim Ryan and their year-old, acre-plus greenhouse in Burton is as automated as any production facility. Small tubes feed nutrient enriched water into each trough. A toothed track automatically makes room for the plants as they spread and grow. Like all plants, this lettuce started from a seed. But instead of soil, Bonner’s hydroponic plants are sown in blocks of water-loving polymer foam. And that’s where another local company comes in, Smithers-Oasis. Smithers' Oasis Grower Solutions division makes the foam blocks. Smithers-Oasis got its start in the 1950’s making that green foam florists use for cut flowers. 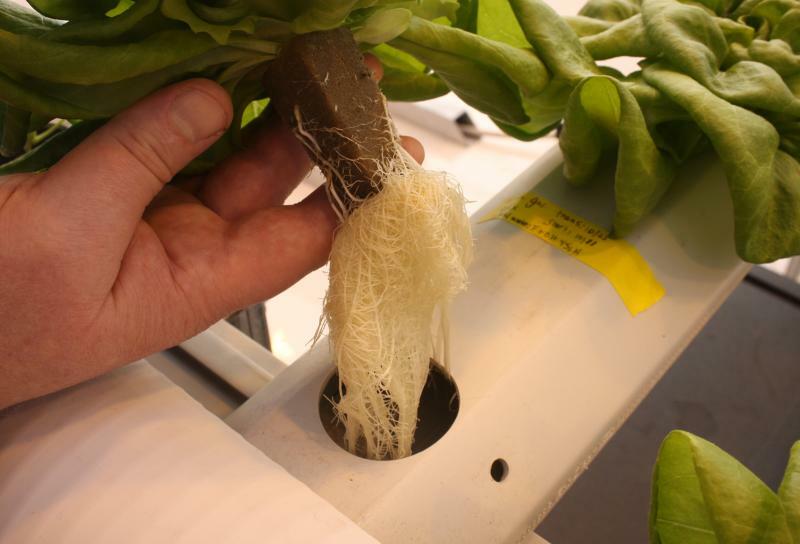 The company is now focusing more and more on hydroponics. It’s working with Great Lakes Growers to develop materials that help lettuce sprout and grow without soil. Marketing Manager Nathan Keil explains that the growing medium is essentially an engineered, or blown, plastic that is formulated for rooting efficiency. Smithers’ foam holds enough water to sprout seeds, and then allows the roots to spread in the hydroponic solution. The technique is being perfected in the company's new experimental greenhouses outside the main production facility in Kent. Keil lifts a mat of roots that dangles in a plastic pipe filled with water. The water is infused with a mixture of the 16 nutrients essential for plant growth. Keil says with this type of system, "you can use about 90 percent less water than traditional agriculture." He says hydroponics is increasingly used to grow food in places with limited land and resources. World-wide, hydroponics has grown to an $8 billion industry that Smithers-Oasis is hoping to tap into. Keil says in Singapore, Japan and China, growing vegetables indoors in water is well-established, but the technique is spreading to Europe and North America. In the U.S., growers like John Bonner at Great Lakes are breaking new ground. Bonner grew up on a traditional farm and knows the heartache that goes with relying on nature for your livelihood. But in his one indoor acre, he produces the equivalent of 25 acres of Ohio crop land. For Bonner, hydroponics and the assembly-line model represent the future of food production. Smithers-Oasis in Kent is also investing heavily in the food-factory model. It now has 19 divisions worldwide. But in Ohio, hydroponics means locally-grown, living-lettuce fresh from the factory, even in the middle of winter. This is an inspiring story. I love the idea that we can grow so much produce in such a small area. My understanding is that these techniques reduce the use of pesticides and herbicides as well. Thanks for the great report!